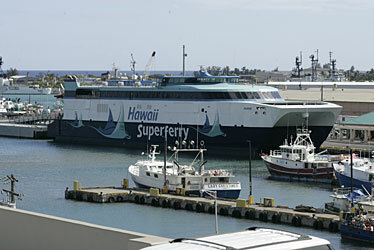 The Hawaii Superferry sits in Honolulu Harbor. The state Legislature gave final approval yesterday to a bill allowing the Hawaii Superferry to sail while an environmental study is completed. Gov. Linda Lingle is expected to sign it, and the Superferry's top executive says he is hopeful the service can be running again by Nov. 15. Superferry Chief Executive Officer John Garibaldi says there still are some procedural hurdles to overcome, but the company will immediately begin work on its restart plan. A Kauai protest leader said his group expects the bill will result in more crowds and more protesters when the Superferry returns to the neighbor islands. The Hawaii Superferry could be plying the waters again in two weeks, the company's chief executive officer says, now that the state Legislature has approved a bill allowing it to operate while an environmental review is conducted. But protesters on Kauai say they will probably be back trying to block the vessel from entering Nawiliwili Harbor, while Maui opponents are hoping a Maui judge does not lift his restraining order blocking Superferry's use of Kahului Harbor. Minutes after House lawmakers gave final approval to the Superferry bill yesterday, CEO John Garibaldi said he was optimistic that the service could be restarted by Nov. 15, but noted that some legal and procedural matters remain. For one, the new conditions under which the ferry can sail still have to be written and approved by the Lingle administration. Garibaldi said the company will spend the next few days formulating its restart plans and bringing back some of the 249 workers that were furloughed last month as the $85 million, 349-foot Alakai idled in Honolulu Harbor awaiting the outcome of a court decision and the special legislative session. He did not say specifically what the company might do to address what lawmakers said was their primary concern: healing a rift that has divided communities throughout the state and pitted neighbor islands against Oahu. Lawmakers wrapped up the second special session of the year yesterday, giving final approval to the Superferry bill. The state House passed the measure by a vote of 39-11, with one representative absent. Senate members passed the bill last week by a 20-5 vote. It now goes to Gov. Linda Lingle, who is expected to sign it into law. "I'm glad the Legislature worked cooperatively to preserve this important transportation alternative for the people of Hawaii," Lingle said in a statement released by her office yesterday. Senate Bill 1, Senate Draft 1, imposes tougher conditions than the proposal introduced Oct. 24 at the beginning of the special session, but emerged as the one most lawmakers can live with. The bill requires, among other steps, that the Superferry devise a plan for how it would handle whale collisions, and requests that an observer be on board when traveling through whale waters. Passengers would be barred from taking fishing nets or soil and dirt on board and would have to declare all plants and fruits or invasive species. The ferry would also have to inspect all vehicles prior to boarding. The rules, their implementation and how they would be enforced are being drafted now by the Lingle administration. House members debated the bill for about two hours yesterday. Both supporters and opponents urged communities to come together, noting that the issue has been one of the most divisive in the state's history. "Hopefully, the differences that we've had can be somehow brought together so that in the next few months we can heal -- so that the community can heal as we move along with this new vehicle of transportation," said House Transportation Chairman Joe Souki (D, Waihee-Wailuku), one of the strongest backers of the Superferry. Opponents remained critical of the ferry, as well as the special session that was called to craft a law in response to court decisions that prevented the ferry from sailing while an environmental impact statement is prepared. The Supreme Court ordered in August that an environmental assessment should have been performed before the state proceeded with improvements at Kahului Harbor for the service. Maui Circuit Judge Joseph Cardoza ruled later that the ferry could not sail while the environmental study was done. "We generally make laws to protect the health, safety and welfare of Hawaii's people and its environment," said Rep. Hermina Morita (D, Hanalei-Kapaa). "We should not be making laws to protect political fixes gone bad, which is what Senate Bill 1, Senate Draft 1 attempts to do." Kauai protest organizers said they are expecting the bill will bring more protesters to the docks when the Superferry returns to the neighbor islands. Protesters took to the waters of Nawiliwili Harbor to block the Superferry's visit in late August. Because of security questions, the company stopped trips to the Garden Island. Jimmy Trujillo, spokesman of the group Hui-R, said he hopes the situation can be resolved in the courts before protesters have to return to the water. He expects that when the Superferry returns, the hundreds will return to Nawiliwili with their friends, relatives and others. Protesters are planning a statewide demonstration against the Legislature's actions on Sunday. Maui residents are not organizing protests at this time, said Irene Bowie, executive director of the Maui Tomorrow Foundation, one of the three groups that successfully challenged the Superferry's exemption from an environmental assessment. "A lot remains to be seen," Bowie added, noting the groups hope Cardoza will not lift his order. "At this point we're anxious to see what kind of provisions" Lingle implements as part of the bill. As "the administration has chosen to go around the judicial system ... there definitely is frustration," Bowie said. Star-Bulletin reporter Tom Finnegan contributed to this report. Gov. Linda Lingle is expected to sign the bill allowing the Hawaii Superferry to operate while an environmental impact statement is prepared. The Superferry could be operating again by the middle of this month. Officials say they will immediately begin work on their restart plan, which includes rehiring many of the 249 workers furloughed last month. State agencies, including the Department of Transportation and the Department of Land and Natural Resources, are developing the rules under which the ferry can sail.